One of these was in the collection I inherited. 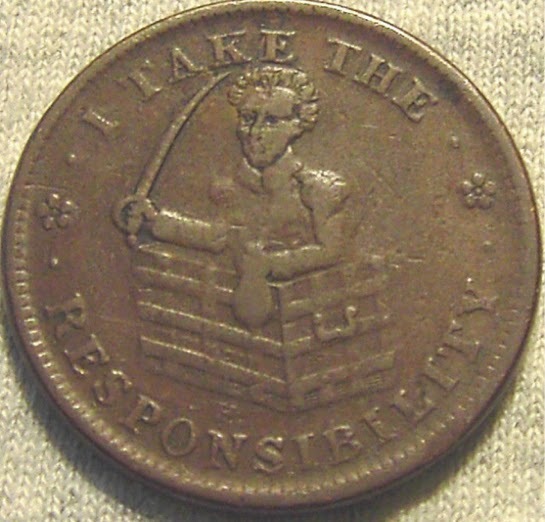 It's an HTT-71 "Jackson" token - a political item protesting his policies. 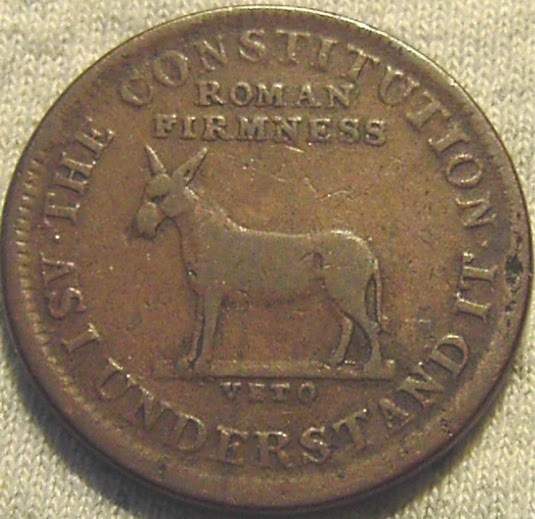 It was made by the Scovill Manufacturing Company of Waterbury, Connecticut around 1833 as political satire directed at Andrew Jackson's desire to abolish the Second Bank of the United_States. “I take the responsibility” is what Jackson said when he transferred the Bank of the United States funds into 25 state banks. On better examples you can see the letters LL.D on the donkey. That was a poke at the honorary degree Harvard had awarded the poorly educated Jackson. Jackson is partially blamed for causing the The Panic of 1837. These are very common, $20 or so (2014). One like it was in the collection I inherited. It is to be regretted that the rich and powerful too often bend the acts of government to their selfish purposes. Distinctions in society will always exist under every just government. Equality of talents, of education, or of wealth can not be produced by human institutions. In the full enjoyment of the gifts of Heaven and the fruits of superior industry, economy, and virtue, every man is equally entitled to protection by law; but when the laws undertake to add to these natural and just advantages artificial distinctions, to grant titles, gratuities, and exclusive privileges, to make the rich richer and the potent more powerful, the humble members of society — the farmers, mechanics, and laborers — who have neither the time nor the means of securing like favors to themselves, have a right to complain of the injustice of their government. There are no necessary evils in government. Its evils exist only in its abuses. If it would confine itself to equal protection, and, as Heaven does its rains, shower its favors alike on the high and the low, the rich and the poor, it would be an unqualified blessing.